Anshe Chesed, Cleveland's first congregation, dedicated its Euclid Avenue Temple at Euclid Avenue and East 82nd St. on March 22 - 24, 1912. All the windows in the sanctuary were by Tiffany Studios. This photo of the sanctuary's east wall was taken on December 8, 2015. In 1957 the congregation moved to Beachwood and the Liberty Hill Baptist Church moved here from Kinsman Road. The Euclid Avenue Temple's Tiffany windows were dedicated along with their new building at 8206 Euclid Avenue on March 22 - 24, 1912. There are eight major windows in the sanctuary, four on its eastern wall (shown above) and four on its western wall. Each window is four feet wide and 14 feet high. They represent eight periods of Jewish history, from the Patriarchs Abraham, Isaac and Jacob, through the Middle Ages. Rabbi Louis Wolsey formulated this concept and worked closely with Daniel Harrington of Tiffany Studios of New York City in their design and execution. The dedication brochure stated they depicted these periods "without departing from the old Jewish tradition of refraining from the use of human figures in the house of worship". In 1957, when the congregation, now Anshe Chesed Fairmount Temple, moved to its new home in Beachwood the Tiffany windows stayed behind. (It is said that there was some sentiment for moving them but the designers of the new building recommended against that as the windows would not complement the new structure's design. Further, the cost of removing and then reinstalling the windows would have been enormous, plus the cost of installing ten modern windows in the old building.) The new owners of the building, the Liberty Hill Baptist Church, have lovingly maintained the sanctuary and the windows. 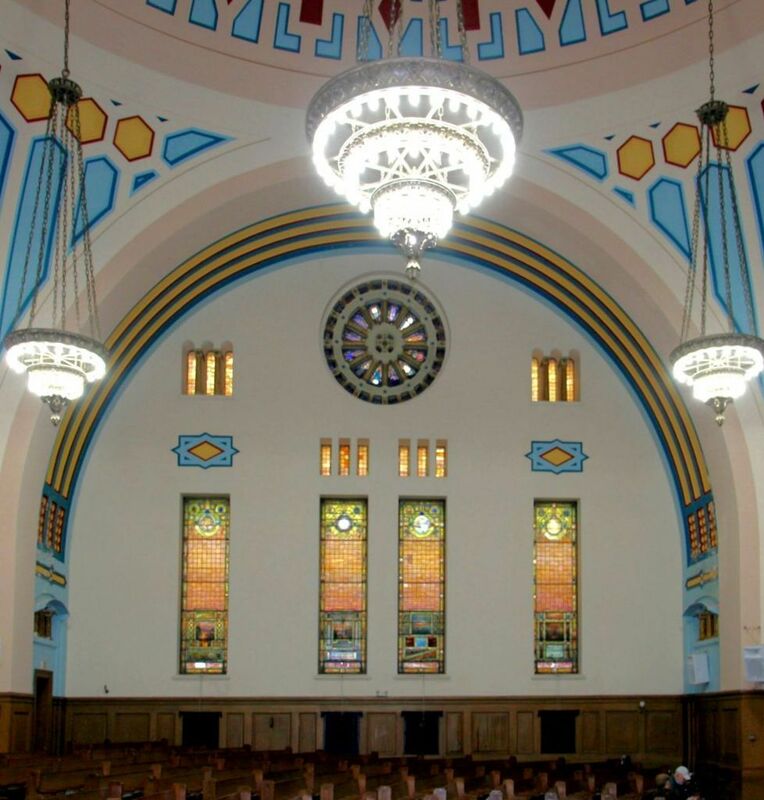 The windows are a highlight on Nate Arnold's tours of old Jewish Cleveland. For photos of the old Euclid Avenue Temple, click here. Clicking on any of the eight windows presented below in chronological order, left to right, will display a much larger image. first four windows, which face east, appear lighter than the last four windows which face west. A few weeks ago Tricia Pongracz, an art and architecture historian who had discovered a treasure of original Tiffany Studio documents in the archives of the Metropolitan Museum of Art, asked for images to be used in her essay on Tiffany windows in synagogues, to be published in 2016 by the museum. Unfortunately our 150 Kb images, a good size when these web pages were created in 2007, were not large enough for quality printing. Soon after this request Nate Arnold, who has led tours of old Jewish Cleveland for years, made the arrangements for new photographs. City planner Robert N. Brown was the photographer. This page and the eight pages that follow now use web-quality versions of these upgraded photos. Most important, Dr Pongracz now has print-quality images she can use. View the Tiffany Psalm of David glass mosaic.